The Town of Morningside failed to prosecute two speed camera tickets disputed in Prince George's County District Court on February 12th, according to a report by one of the defendants. One of the defendants reported to us that "a court assistant" advised her to plead guilty. However, she wisely did not follow this incorrect advise. "the biggest lesson I learned was when the judge says: " you have been charged with doing 43 mph in a 30 mph zone do you agree or disagree? "...I'm supposed to say DISAGREE since Morningside didn't show up! I said the right thing but it took me a second because the advice I got before I went in was "just plead guilty but say you have an explanation... it pisses the judge off when you say you're not guilty of a camera speed violation." This motorist was prepared not only to dispute the recorded speed, but also the legality of the placement of the speed camera on Suitland road. However since the prosecution did not appear, this was not necessary. It pains us when motorists who says they are innocent goes to court only to plead "guilty with explanation", especially if it is the product of someone giving them bad advice. If you are disputing a camera ticket, you ALWAYS plead "NOT GUILTY". "Guilty With Explanation" means "GUILTY". You have just waived ALL your legal rights and the prosecution doesn't need to prove anything -- please do not waste the court system's time by doing that. The worst case scenario of pleading "NOT GUILTY" on a speed camera ticket is exactly the same as the consequence of pleading "GUILTY", which is that you will be found guilty anyways. Even if they don't have the skills to develop a real defense, a defendant can always state that that they believe the prosecution needs to prove the device was operated legally, and ask to examine each piece of evidence. We are not saying your odds of prevailing are good with that approach, but it is still better than having a zero percent chance. Moreover, if you think you are innocent but are unsure whether you can make a case, the correct thing to do is to request a hearing prior to the due date. This gives you time to conduct research, and you can always pay the fine before the hearing if you conclude you don't have a defense. Morningside previously dropped the case of a different motorist who happened to have a video recording of themselves driving past the camera, which was reported on WTOP. The video showed them driving at the speed limit according to the speedometer. "If the camera is calibrated incorrectly, this is an issue that the Town of Morningside would need to address with the vendor to correct and ensure the camera remains properly calibrated. We have not seen a copy of the contract between Morningside and Breckford, but there is probably language in it that speaks to the specifics of calibration. So, if there is an issue, that would make it a contractual one that the town needs to address with the vendor. All of this would amount to a civil issue and our office is responsible for criminal cases only. Therefore, your complaint/concern would need to be addressed by the Town of Morningside." So basically, according to the Prince George's County State's Attorney, improper calibration of a speed camera is just a "contractual issue" and there is no legal recourse if the local government refuses to address the systematic issuance of erroneous citations. 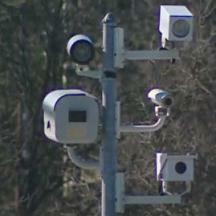 The cameras in question is located on Suitland Road, near Joint Base Andrews. One of the cameras is pointed directly at a busy I-495 overpass, with fast moving traffic whizzing past in the background at all times directly behind the cited vehicles. Our analysis of images from another motorist's citations did not indicate that the distance the vehicles moved between images was consistent with the recorded speeds, and the images clearly showed other traffic traveling in the background nearby. The Town of Morningside denied a Public Information Act Request for all of their annual calibration certificates (past and current) and daily setup logs for a few specific dates. The response from town attorney Todd Pounds was that they don't maintain any calibration records because the town is not the "operator" of the program. We are currently in a legal dispute with Morningside over their failure to comply with the Maryland Public Information Act. Even after we filed for judicial review, the town's response to our Public Information Act Request so far has been to respond with legalistic arguments about process service, threatening to respond by asking for sanctions against the requester, and the production (six months after the original request) of just a few pages (but nowhere near all) of the calibration documents we requested. Morningside installed the cameras on Suitland Road after the county denied their request for permission to put the cameras there.